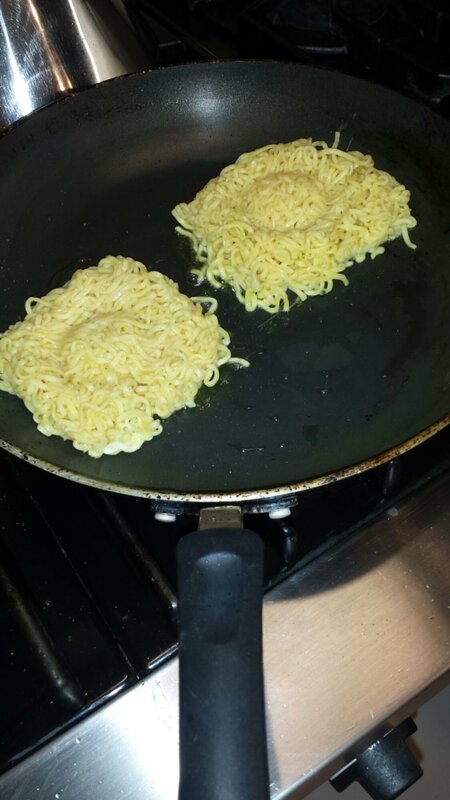 DIY : Ramen Burger !! Meat Mondays … We’ll I caved in for a #MeatMonday over a Meatless one … but for good reason !! Low & Behold the RAMEN BURGER. A scrumptious treat that is easily hand made by YOU. First of all you have to gather your ingredients …. This is only for making the “Ramen Bun” – not the burger, that is up to you! First Step: Follow the ingredients on your Ramen packet – mine say to boil a pot of water with the appropriate amount of water, once it is at a boil, add the packet of ramen, wait for about 3 minutes // until it is soft, then drain almost all of the liquid, save a smidgen for adding the seasonings, then mix around & drain fully. Second Step: you will let the noodles cool for about 10 minutes, just put it off to the side or whatever works for you. Then when the ten minutes have passed you will crack one egg into the pot/bowl whatever and stir in it thoroughly. 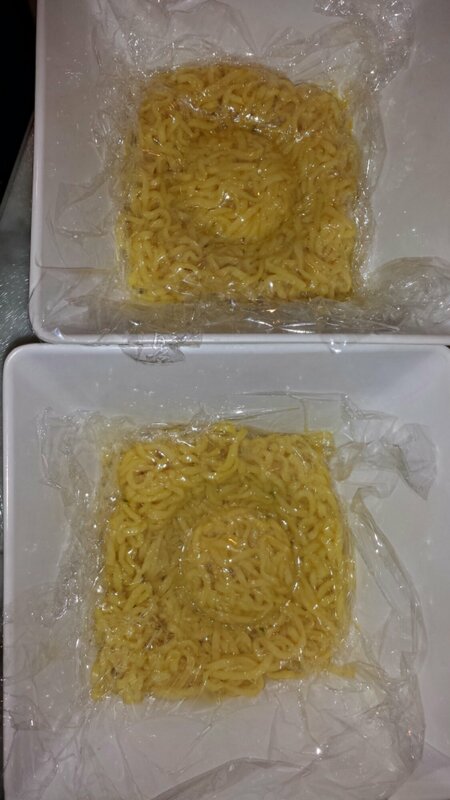 Third Step: you will separate the noodles into two separate bowls (EVENLY) – with flat bottoms – these will turn into your buns !! Shape wisely … I went with square. 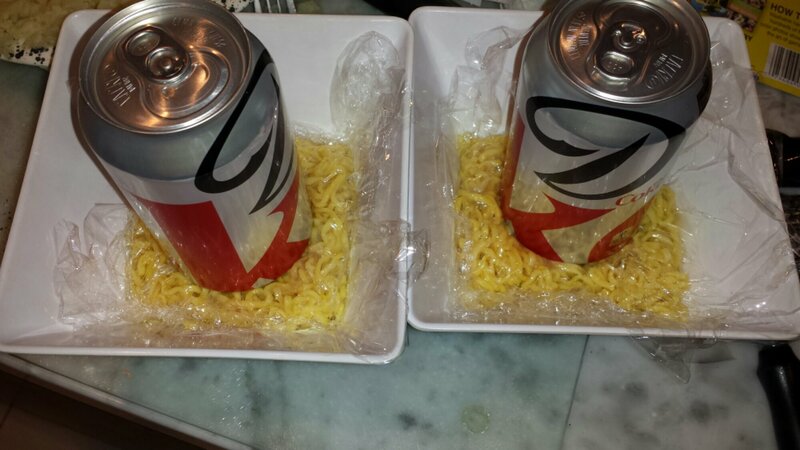 Then you will cover the noodles with the saran wrap & place the cans ( or cups) on top. The diet coke gives this dish a “healthy” feel – but really its purpose is to weigh down the ramen buns! Fourth Step: Place these two bowls into the fridge for 30 minutes – or if you get distracted a little bit longer is okay. Walk around your kitchen , do 10 push-ups, 25 jumping jacks & 15 squats – you got to make room for this delicious treat !! Fifth Step: When you remove the bowls from the fridge and take off the pop cans, your result should look something like this photo below! Sixth Step: What you’d like to do next is preheat your skillet pan and once it gets warmed up it is time to pour on the oil ! Unwrap your soon-to-be-buns and toss them onto the skillet pan ! 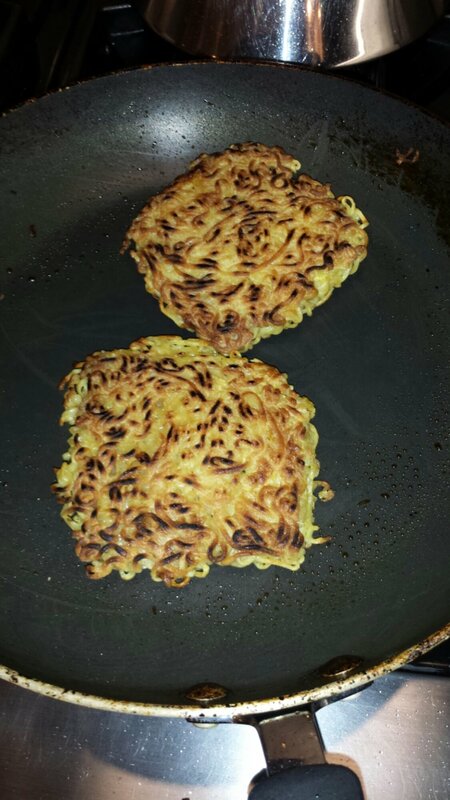 Let them sizzle here for 3 – 5 minutes then flip them over. Let the other side cook for about 2 minutes. Flip back & Forth until they are the color of your liking. You might be interested in adding a little bit more oil if you’d like your buns to get browner. TA DAHHHHHHHH !!!! You’re DONE! Add your burger between your buns – and ENJOY !! I personally like plain – some other recipes will add green onion , lettuce, soy or siracha ketchup! Honestly one pack made enough for 2 people to enjoy it. Depends also how big your burgers are ! 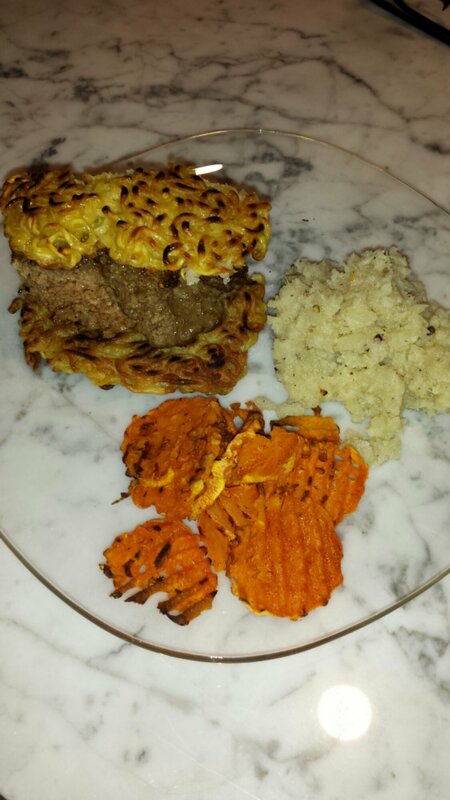 Pictured above my side dishes are home made Sweet Potato Waffle Chips ( baked in the oven on 400 degrees) & Mashed Cauliflower ( Paleo, can be made vegan if you don’t add butter) , but let’s be honest your not sticking a giant juicy burger in it than !! But you could add a Veggie Burger. To each his or her own can add their flare !! Tequilla Shot a day – get skinny ?? !